There has been much hype, amongst the media and sections of the public, in the run up to this year’s provincial and national elections in South Africa and, for some, the arrival of new parties to the electoral arena has renewed their faith in the possibility of an electoral solution to the myriad of problems facing South Africa. Politicians from across all parties have been using this hype and a seemingly renewed faith in the ballot box to their advantage. The question, therefore, is: can equality, socialism, national liberation or ‘economic freedom’ – or even a respite from state violence – for a majority be brought about through parties and activists entering into the state or through voting for parties that promise not to use the state for violent or oppressive means; or will this only lead to a dead-end for the working class yet again? There has been much hype, amongst the media and sections of the public, in the run up to this year’s provincial and national elections in South Africa and, for some, the arrival of new parties to the electoral arena has renewed their faith in the possibility of an electoral solution to the myriad of problems facing South Africa. What was for many an unexpected announcement by the shack-dwellers’ movement Abahlali baseMjondolo (ABM) that for the first time since 2006 they will be breaking with their “No Land! No House! No Vote!” campaign – and their subsequent invitation to all political parties excluding the ANC to campaign for their votes – has added to the hype. So, too, have statements by some activists that the current period represents a “shift towards radicalism” by the masses and that a large-scale vote for “parties that are standing on the platform of radical change” will help to solidify this new radicalism among the masses and lead to further struggles against ANC rule. 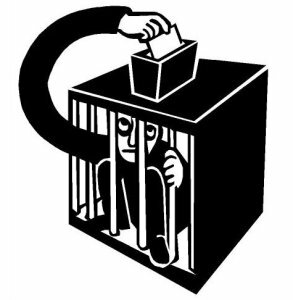 The “Vote No” campaign for people to vote for anyone except the ANC – or otherwise to spoil their ballot – in order, as with ABM, to break the absolute majority of the ANC has also served either to renew or sustain dwindling interest in the ballot. The anarchist Bakunin foresaw the possibility of such a situation arising in cases where supposedly implementing socialism or bringing about national liberation was based on capturing state power. Bakunin said that the “statist path” was “entirely ruinous for the great masses of the people” because it did not abolish class power but simply changed the make-up and faces of the ruling class. Consequently, he stated that if the socialist struggle or a struggle for national liberation was carried out with “ambitious intent to set up a powerful state”, or if “it is carried out without the people and must therefore depend for success on a privileged class” it would become a “retrogressive, disastrous, counter-revolutionary movement” 1. He also noted that when former liberation fighters or activists enter into the state, because of its top-down structure, they come to no longer represent the people but themselves and their own pretensions to govern the people. This has not been due to any faults in the personal characters of such activists entering into the state, but rather due to the logic of the state – which exists for a few to govern. The past, therefore, tells us that even if a party like WASP (which is far more principled than the EFF) enters into the state, in all likelihood their character would alter, they would become rulers and governors; and the working class would remain in a subordinate position.